The purpose of the masks that these creatures wear is unknown, as is the countenance that they obscure. These terrible forms are rarely seen by the living, and those who live to speak of them had no leisure to study their foe. 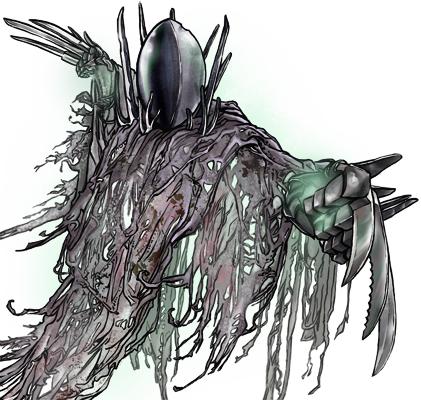 Special Notes: If there is an enemy of the target on the opposite side of the target while attacking it, this unit may backstab, inflicting double damage by creeping around behind that enemy. Spirits have very unusual resistances to damage, and move quite slowly over open water. This unit is able to hide at night, leaving no trace of its presence. This unit’s skill at skirmishing allows it to ignore enemies’ zones of control and thus move unhindered around them. Last updated on Sat Apr 13 00:39:51 2019.